December has gotten pretty crazy for me (and the rest of the world), so I’m sharing some of my favorite comfort foods from Appetite For Reduction! Tell me your favorite comfort food meals in the comments and maybe it will inspire a new recipe. It’s hard for me to imagine having black eyed peas without greens. They’re forever linked in my tastebuds thanks to my idea of what southerners eat every day, even though they probably eat portobellas and arugula, just like the rest of us. Anyway, sometimes I just don’t feel like using two pans. This dish works on so many levels because you don’t need to saute the greens in a ton of oil and you don’t need another sauce for them, everything comes together in one pot. The Bye and Bye, my favorite vegan bar in Portland, puts what I suspect is a lot of hot sauce in their black eyes peas, so that’s what inspired this flavor profile. I love to use Cholula hot sauce in these, but use your favorite medium heat hot sauce (like, don’t use Sriracha, but Tabasco would be fine.) Serve with Mashed Ginger Sweet Potatoes and Apples, for the perfect balance of spicy, savory and sweet! ~This recipe calls for shredded greens, but all i really mean is very thinly sliced. A fast and easy way to get this done, is to pile the leaves on top of each other and then roll them up. You’ll see that it’s very easy to slice them that way. ~Peas and greens are a wonderful combination for taste and nutrition. With one serving you will eat as much fiber as the average American gets in a whole day! Plus a day’s worth of vitamin A and a quarter of the iron. Combine with one serving of the Ginger Mashed Sweet Potatoes and Apples you’ll have 16 grams of protein and nearly one fifth of your calcium for the day. All with only 2 grams of fat and under 400 calories. ~Depending on how sweet your apples are, you may need even less agave than listed in the sweet potatoes, or perhaps even no agave at all! Taste before adding. Preheat a 4 quart pot over medium heat. Saute the onion in the oil until translucent, about 5 minutes. Use a little cooking spray if needed. Add the garlic and saute a minute more. Add the greens, 1/4 cup of water and salt. Cover the pot and cook the greens down for about 10 minutes, stirring occasionally. Add black eyed peas, tomato sauce and broth and thoroughly mix. Cover pot and cook for about 5 minutes, stirring occasionally. Add hot sauce and liquid smoke, then use a potato masher to mash some of the beans, about 1/4 of them, to thicken the sauce. Cook for about 5 more minutes uncovered. Taste for salt and seasoning. You may want to add more hot sauce, I often do, but I err on the side of caution with recipes for spicy things. Serve hot. Preheat a 4 quart pot over low heat. Spray with cooking spray, then add apples, sweet potatoes, water and salt. Cover pot and sweat the apples and sweet potatoes for about 20 minutes, stirring often. What this means, is just to cook them slowly and let them steam. You want to coax the misture out of them, but if you make the flame too high they’ll burn and cook unevenly. After 20 minutes, you can turn the heat up just a bit. Add a little more water if needed. Cover and cook 20 more minutes, paying close attention so that they don’t burn, and stirring often. When they’re very tender, they’re done. Mash with a potato masher. Add the agave, cinnamon and ginger, and mash some more. Taste for salt and seasoning. Serve warm. Actually, this Southerner would choose blackeyed peas and greens over portabellas and arugala (yuk!) anyday. 🙂 I’ve been meaning to make this recipe from AFR! 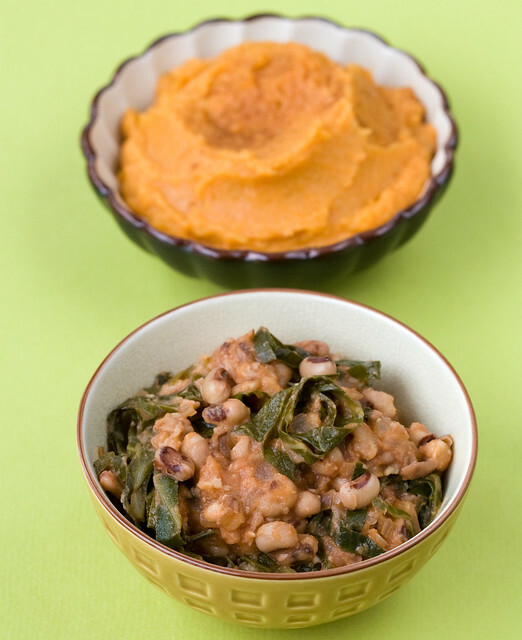 Black eyed peas and greens (or cabbage) are the staple dish for a Southerner on New Year’s Day. The peas are for luck and the greens for money, that’s what my Memaw used to tell me! Yes of course, black eyed peas on New Years! I should have mentioned it in the recipe, thank you! This black-eyed pea dish is one of my favorites from AFR (and that’s saying a lot, considering I love every recipe I’ve tried!). They’re great with the Caulipots, but I’ll have to try them with these mashed sweet potatoes, too. Yum. I am absolutely in love with your gingery sweet potato and apple recipe! I used to be a sweet potato hater but I have to tell you that all of your cookbooks have really transformed my palate and taught me to appreciate so many veggies that I thought I didn’t like. Thank you thank you! Appetite for Reduction in particular has really helped me to up my veggie intake in such a wonderfully tasty way. Anyways, as far as comfort food goes I love a good stew or potpie. I would be interested to see if it is possible to make a good crust that is low fat. my idea of comfort food has to be curry! I live in kenya where we have a vibrant and active indian community so I grew up with good indian food. I especially love daal with chapati….yuM! When I want something really comforting I go to 1 of 3 things every time – a pea, potato and paneer tomato curry with cumin rice which is my mother in laws recipe (recipe on my blog), lemon mock chicken with brocolli and roast potatoes which is my mothers recipe made veggie or your heavenly chickpea and seitan cutlets with mashed potatoes and mushroom gravy!! Comfort food – Eastern European stuffed cabbage rolls ! Do it, Isa, do it! You will be my hero until the end of time. Unless you already have and I’m behind the curve ! Smoked salt is pretty darned awesome with the black eyed peas, and I substituted squash for the sweet potatoes – VERY tasty indeed. Thanks for the inspiration and recipes, Isa! my favorite comfort food prior to being vegan was grilled cheese sandwiches, but I don’t like fake vegan cheese enough to have alone with bread. is there a cheddar/american version of a nut cheese you could use for grilled cheese sandwiches? We made your cashew queso a couple weeks ago and we were floored! Want. Right now. Serious. 🙂 I am all about dynamic flavors, and this one sounds like it would hit the spot. And I agree with Amy – cabbage rolls would be awesome. Soooooo good. I love this and so many more recipes from the AFR book. I feed this to the whole family and conveniently forget to tell them it’s vegan. (Sans the hot sauce for the kids). Forgive me if you’ve done this already, but one comfort food I miss when I’m off meat is a spaghetti bolognese. I was grumpy when our daughter went vegan. That is, until we got Veganomicon and Vegan with a Vengeance. Then I started having fun with it. Now I often express my gratitude that she freed me from the boneless chicken breast. I’m from Phoenix, Arizona and grew up eating Mexican Food. I haven’t made Black Bean and Red Rice stuffed Chile Relenos for awhile but have a hankering for it’s spicy, sultry goodness. My friend Maria from Mexico City taught me how to make authentic enchilada sauce with dried chiles and tomatoes, which I put over slightly roasted and peeled pablanos stuffed with black beans and red or brown rice. We have never missed the cheese, since we started making Relenos this way. MMMMM I’ll give you the recipe if you want it. 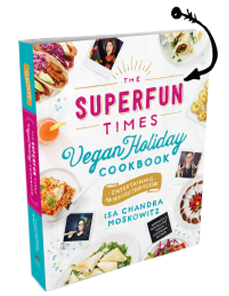 BTW-I love your book and have made many recipes from it with my own tweeks of course. This looks great. Hoping to make it this weekend. But what’s the note on the grated ginger? Oops, I think it was supposed to be that if you freeze ginger it’s much easier to grate. Holy crapballs. I made this tonight and it was so delicious I could possibly keel over. Perfect mix of homey cinnamon, maple agave and a lil ginger contrasted with the smokey hotness of the greens & beans. For dessert I made the Chocolate Bottom Macaroons. Way to go!!!! Made this and was THRILLED at its deliciousness and the generous portion size. I entered the recipe into Weight Watchers and if you divide the whole batch by 6, it’s only 7 points/serving (for the potatoes AND the peas). Happy happy! Oooooh! This recipe looks so good! I also want to make vegan cabbage buns. They are a tradition in my family but no one wants to try my meatless version. I want to make something that will make my grandparents eat plates of vegan cabbage buns! This was AWESOME! All your recipes are amazing, thank you! I made this a few days ago. It’s the best black eyed peas I’ve ever had. i just made the black eyed peas last night! they came out delicious and super easy! This was my first time ever eating black eyed peas totally enjoyed both the peas and the mashed! This was AMAZING….never liked black eye peas until now…..especially with this sweet potatoes! This rocked! We just made this and enjoyed it for our Sunday dinner. I changed it a bit adding thyme, chipotle powder, and all spice in addition to the smoked paprika for spices to the black eyed peas. We loved how zesty these blacked eyed peas were. And we loved the apples with the sweet potatoes (I baked mine)–really yummy. We will be making this easy to prepare meal again. Thanks for sharing this with us! Great pairing and a fabulous meal! I went with kale and I liked the texture the rippled leaves added to the dish. Thanks so much for sharing this recipe!!! Damn this was freaking delicious! We made it last night with some collard greens from our CSA. I almost was going to skip out on the mashed sweet potatoes and apples, just to cut down on the time, but I am so glad I made both because they were excellent together. If you start the sweet potato/apple stuff first, you can easily alternate between the two (one is cooking, the other is getting stuff added to it, etc). Thanks so much for your fabulous recipes! i just made this tonight…only subbed a few whole chopped tomatoes for the sauce. and used the chipotle smoked tabasco. freaking amazing. I’ve been making this recipe for black-eyed peas and greens since I bought this book – and I love them! But tonight I tried this potato recipe for the first time with apples and sweet potatoes from the farmer’s market and – WOW! – I will never go back to plain old mashed potatoes again! YUM! My husband and I are both Southerners now living in the NYC-area, and we’ve been preparing the black-eyed peas and greens regularly, but with a fun addition: vegan chorizo! Delicious! And every recipe we’ve made from my copy of AFR has been stellar. Thanks, Isa! Here’s a note for Emmy above, I think spinach would be a great replacement so long as it’s regular spinach and not the delicate small leaves we call “baby spinach” here. My feeling is the greens should absorb the flavor and offer some chewiness to the dish. My comfort food choice is really boring: its garlic and mustard mashed potatoes. Normal mash doesn’t do much for me, but with a bit of garlic and mustard, that’s me sorted! I have to buy this book! My favourite comfort food is a stew of potato, onion, cabbage and white beans….sounds grim, tastes fab! It’s a version of Caldo Verde. This was one of the first Vegan recipes I made about a year ago. My “meat eating” hubbie devoured this and requests it all the time. I’m quite surprised that I didn’t like it that much… The cinnamon in the sweet potatoes and the liquid smoke in the greens didn’t fit together to me… But as I see from the comments below, it looks like many people loved it! Thanks, thought, for your great website! YUM! This was so good! We made it today, and plan on eating the leftovers for good luck on New Year’s Day. Delicious! I made yesterday morning and really added a lot of salt, pepper and Cholua at the end. Very tasty! I had for lunch and reheated for everyone to try as a side for dinner. It was a hit. Served with roasted butternut squash, you got the contrast in flavors Isa wrote about. It doesn’t look all that fancy, but it is good! And everyone wants some luck and prosperity! Thank you! Do you know if any of this freezes well? This sounds so good I’d love to make a triple batch of it for a big party we have coming up, to make cooking in the days prior to the event easier. Seems like there shouldn’t be issues with freezing the sweet potatoes, and maybe I’d just undercook the kale & beans slightly? Thanks in advance for your opinion! I make this every New Years Day. I love black-eye peas, and the greens just add that perfect complement. Sweet potatoes are so delish! Oh, this was so good! I made it for dinner tonight and followed the recipe almost exactly. The only thing I did was put the blackeyed peas and kale over a garlicky brown rice and quinoa mix. Thank you! Oh, thank glob this recipe is posted here. I loaned AFR to someone in the summer and she’s yet to return it. But I have to (have to!) make this every New Years Day! I’m English sorry, and not too sure what you mean by ‘tomato sauce’. Would chopped tinned tomatoes work? Or tomato purée? Thanks if anyone can advise!